Thought to be one of the oldest organisms east of the Mississippi, the Angel Oak tree is more than 500-year old oak tree in Charleston, South Carolina. 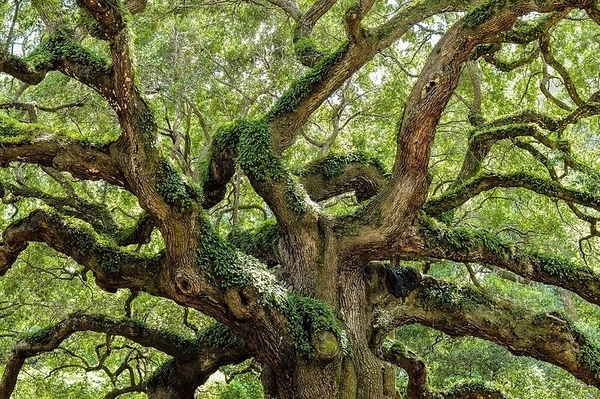 Ruth Miller and Linda Lennon explore the tree’s centuries of history in The Angel Oak Story. In this excerpt, Miller and Lennon talk about the tree’s earliest history. Thus wrote Abraham Waight in 1701. The words linger across the centuries, much as the Angel Oak might speak to generations present and future. It is appropriate the story the patriarchal oak would tell is the story of Abraham Waight, for he was the first man to own the property on which Angel Oak grows. The story the tree could tell is the story of Carolina. So to all whom these presents shall come, Greeting. Return to the year 1663. Charles II is restored to the British throne. To reward eight of his important supporters, the king grants them a tremendous piece of property in the New World. The northern boundary is Virginia, the southern boundary at present-day St. Augustine, Florida, and the western boundary the Pacific Ocean. This, the colony of Carolina, is granted to eight proprietors, all experienced in colonial affairs. 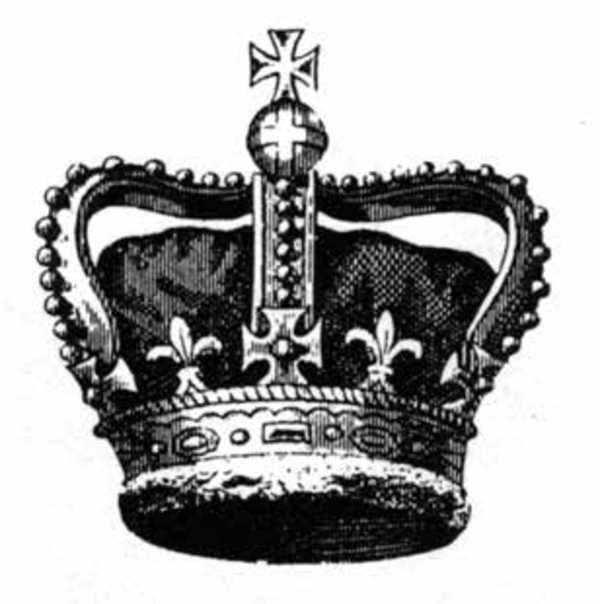 A British crown. Reprinted from The Angel Oak Story by Ruth Miller with Linda Lennon (pg. 15, The History Press, 2018). The land is theirs to colonize, to govern and to profit from. In essence, the settlement of Carolina was a business operation, and the corporation owners’ chief aim was to make money. They understood the way to profit from a colony was to populate the land with industrious, productive settlers. The proprietors used their knowledge of colonial affairs to compose a legal document that governed Carolina. Complicated and unworkable in many specifics, the early law held two irresistible promises for Carolina’s pioneers: land and religious freedom. The Religious Toleration Act is generally credited to the ablest of the proprietors, the Earl of Shaftsbury, and the influence of his associate the English philosopher John Locke. Carolina offered an island of toleration to Europeans and discontented settlers in other colonies. The Fundamental Orders for Carolina read, “Any seaven or more persons agreeing in any religion shall constitute a church or a profession to wch. they shall give some name to distinguish it from other.” This was a unique expression of religious liberalism in an age boiling with religious persecution. The Angel Oak tree. Image by Agupta96 [CC-BY-SA 4.0], via Wikimedia Commons. By 1700, Baptists, Huguenots, Jews, Presbyterians, Puritans and Quakers had all come to the Lowcountry. The lure of the land was equally attractive. A system of “headrights” promised acreage to every immigrant for himself and any others whom he brought to Carolina, including family, indentured servants and slaves. The proprietors envisioned a feudal system of massive estates supporting a wealthy aristocracy. Their plan for titled nobility with North American landgraves and cassiques may sound comical today, but the huge tracts of land became the plantation system that determined the whole course of Carolina’s history. In 1734, the story moves to the church of St. Johns, at the entrance to Angel Oak Road, formerly known as Agricultural Hall Road. In the early 1700s, the Church Act was passed by the Assembly of Carolina and approved by the proprietors. The law continued to allow freedom of worship but required taxes for the support of Anglican parishes. The first sanctuary of St. Johns was destroyed during the Revolutionary War and replaced by a new building in 1817 on the old foundation. The first pew list of the antebellum church contains an important new name: number twenty-seven is labeled Angel. This is the same Angel who is to give Angel Oak its name, for the Waight plantation become the Angel plantation in the year 1810.